The journey, from London at least, is a cinch: an eight-hour night flight to Nairobi and within 45 minutes you’re stepping through a gateway for the one-hour hop to Kigali, Rwanda’s capital. Arriving there is a pleasant surprise because this has to be the cleanest and tidiest city in Africa, the result of Saturday mornings each month being devoted to a country-wide cleaning campaign which closes all shops and businesses and sees every citizen collecting rubbish and smartening up the appearance of public areas, a task made a little easier by a nation-wide ban on plastic bags. After an intercontinental trip, though, it’s your body that demands some attention and the creature comforts of Mille Collines hotel [ www.kempinski.com/en/kigali/hotel-des-mille-collines-managed-by-kempinski/welcome/ ] provide instant therapy: a pool, attractive grounds and, from only the fourth floor, grand views of some of the rolling hills that give the hotel its name. Strangely, though, there is no commemoration of the hotel’s momentous role in saving the lives of 700 Tutsis during the 1994 genocide, the subject of the Hollywood movie Hotel Rwanda. Only one night needs to be spent in Kigali and the place for a divine, candle-lit meal before leaving is Heaven restaurant [www.heavenrwanda.com], open on all sides under a huge bamboo ceiling. The food has local touches like a sauce made from pounded cassava leaves, adding a bit of attitude to your plate, and non-European apertifs that include Urwagwa Sour (a banana beer lightened with citrus flavours). Nyungwe Forest National Park, in the southwest of Rwanda, takes half a day to reach from Kigali but there are rich rewards by way of luxury accommodation, tracking expeditions to view primates and forest walks that will banish ennui. The prize draw is the opportunity to get close to gatherings of wild chimpanzees and you’ll know when they’re around given their loud, eruptive hooting which sounds like a wake-up call for all sentient life in the forest. How many chimps you see and how close you get depends on the trackers’ success in locating them but you’d be unlucky not to see any. The setting is unique, inside a tea plantation and on the edge of the forest, and the wooden chalets come with a hot tub and shower, a balcony and satellite TV. Best of all is the heated infinity pool — from where you gaze out at a green and serene landscape of ancient forest — and the spa with massage and facial therapies, waxing, manicures and pedicures. Pampering the body in the afternoon after a morning spent tracking rare primates and with an evening catching up with the rest of the world over Wi-Fi in the bar with cocktails before dinner – Rwanda hits the spot. Invigorated and raring to go an incomparable African adventure set off the next day for a drive north alongside Lake Kivu, with the (Democratic Republic of) Congo across the water. The scenery is a picturesque mix of lake, hillside, coffee plantations and roadside glimpses of everyday life. The country is not steeped in poverty, women are far from being marginalized — Rwanda’s parliament has a higher percentage of women than men (currently at a record high of 29% in Britain) – and corruption in public life is the lowest in Africa (and probably higher in some European states). It will be late afternoon before you reach the town of Rubavu but rest and recreation is on hand at Lake Kivu Serena Hotel, [www.serenahotels.com/serenalakekivu/default-en.html] positioned by the lake, with private access to a stretch of sandy swimming beach, and a lovely spot for al fresco dining from a menu that beats the socks off most restaurants in Rwanda. Caesar salad, stir-fried prawns in ginger or chicken masala will not taste as good here as back home but the kitchen makes an effort to be different and avoids the dreaded buffet syndrome. It takes about 45 minutes to walk from the hotel to the border post with the Congo but while visas are available and the town of Goma only a stroll away, the other side of the border is volatile territory and currently it is not advisable to go there. Rwanda, by contrast, is wonderfully safe and it is time to think about tracking down a troop of mountain gorillas. 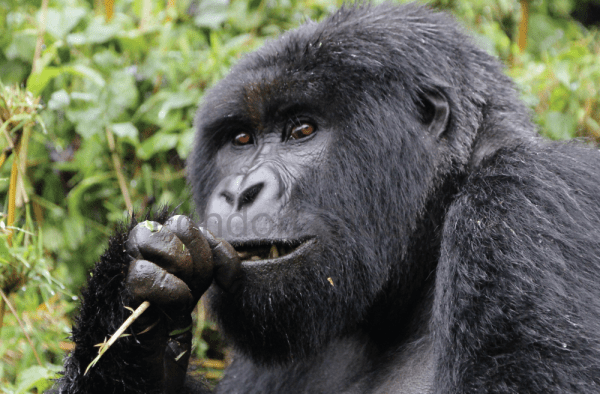 Tracking gorillas in Volcanoes National Park is the reason most travellers come to Rwanda and the procedures for doing so are part of a well-organized programme that balances conservation needs with the protection of these highly endangered primates. 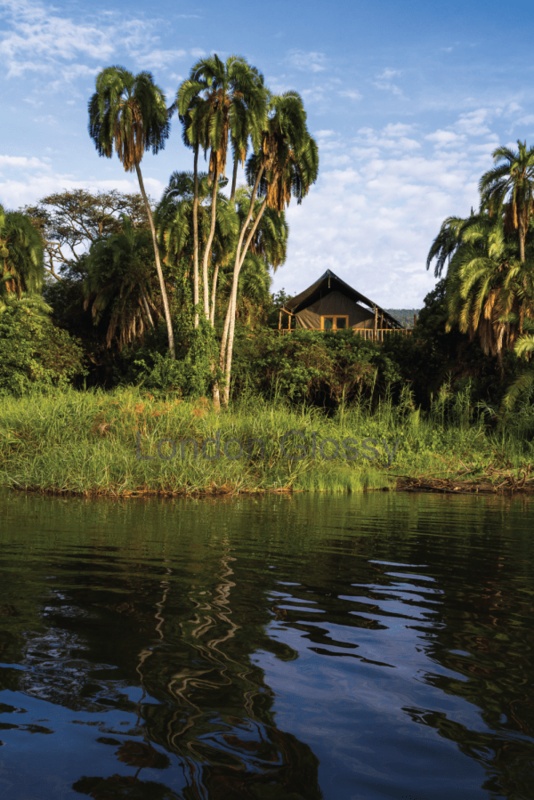 It takes an hour to reach the Park from Lake Kivu Serena Hotel but you need to be at the park by 7 am so better to stay at one of the nearby lodges. Full details are available in the Bradt travel guide to Rwanda [www.bradtguides.com/shop/africa/rwanda.html], a book that is fairly essential reading before and during any trip to the country. Suffice to say that tracking and encountering the gorillas is a once-in-a-lifetime experience; the best advice, given that you’re allowed only one hour in their company, is not to spend all the time manically clicking away with your camera. The experience of being close to mountain gorillas is a sublime one but not when seen through the lens of a camera: simply being incredibly close to them, we’re talking a few metres here, is what it’s all about. Young gorillas may try to show off in front of you, beating their chest like a miniature Tarzan, and adults will sometimes pause to stare into your eyes: close encounters, not of a third kind. The east side of Rwanda, bordering with Tanzania, has been below most travellers’ radar partly because the seeing of mountain gorillas has monopolized attention but this is about to change now that Akagera National Park has added lions to its superior menagerie of elephants, zebras, buffalos, giraffes, hippos, warthogs, antelopes, baboons and leopards. The place for a memorable night’s sleep is in one of the sturdy steel-framed tents at Ruzizi Tented Lodge [www.african-parks.org/Park_2_92_Ruzizi+Tented+Lodge.html]. 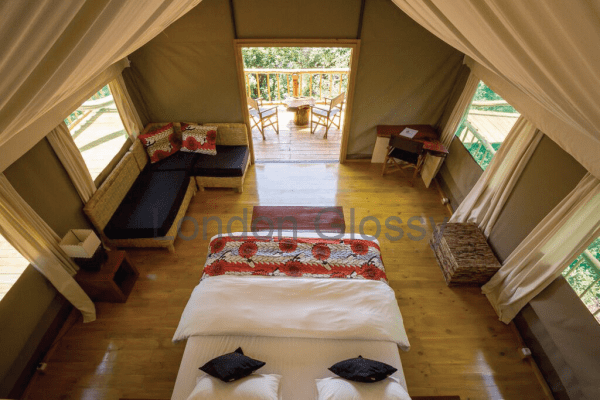 The tents have all the comforts you would expect and the location is a tranquil lakeside spot with an abundance of bird life and vervet monkeys hanging around the boardwalks that connect the tents with the restaurant and bar. Boat rides on the lake to view wildlife close up and safari trips into the park, day and night, easily fill a two-night stay.